The term superfood is thrown around loosely, but it always points to the same thing: an incredibly healthful, natural food that can boost your health in numerous ways. Green tea, berries, and turmeric are just a few that could be considered superfoods, but rarely do we think of onions when we are talking about these dietary golden-children. Still, the health benefits of onions are what make this savory delight a potent health-booster. Most of the benefits of onions come from something called quercetin. Quercetin is a powerful flavonoid, or type of antioxidant, that provides numerous benefits throughout the body by protecting cells from free radical damage. Onions are one of the top dietary sources of this powerful compound. 1. Reduced Cancer Risk – Several studies have connected quercetin with reduced cancer risk. One study in particular found that onions combined with turmeric create a synergistic effect that reduced both the size and number of precancerous legions in the intestine, reducing colon cancer risk. Another study, this one from France, found that women who ate more garlic and onions had a lesser chance of developing breast cancer. 2. Improved Oral Health – Contrary to common sense, which tells us onions make your breath stink so can’t be all that great for your teeth, chewing raw onion is known to improve the strength of teeth and kill problem-causing bacteria that can lead to tooth decay. 3. Cardiovascular Benefits – There are many cardiovascular benefits to eating onions. Researchers with the University of Utah found that quercetin is able to significantly reduce high blood pressure in hypertensive adults. 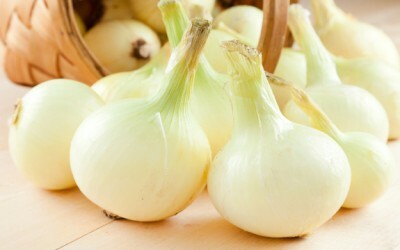 The sulfur in onions may also be able to improve cholesterol levels and red blood cell health. 4. Anti-Inflammatory Powers – Quercetin, the star of onions, is known to have powerful anti-inflammatory benefits. According to Arthritis Today, this is why it can aid in the treatment of arthritis. But anti-inflammatory benefits may also help fight off inflammatory diseases like diabetes and more. Onions are also good for relieving clogged sinuses, soothing an earache, relieving the pain of a bee sting, and detoxifying the body. As an added bonus, they are very versatile in the kitchen and can be cooked with just about any dish or eaten raw on a salad.